Tyre (صور‎, Ṣūr or Soûr in Arabic) is a city along the coast of southern Lebanon, located 82 km south of Beirut and less than 20 km north of the border to Israel. It's a small city of 60000 inhabitants, the current headquarter of the UNIFIL mission. The population of Tyre is a predominantly Shiite muslim with a small Christian community. 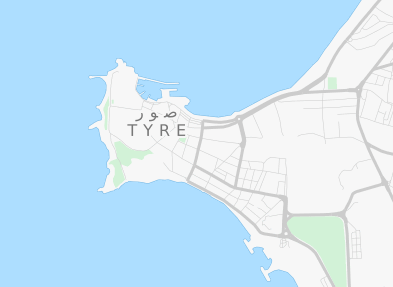 Tyre was founded around 2750 BC and was a great Phoenician city that reigned over the seas and founded prosperous colonies such as Cadiz and Carthage. Conquered by the Persians in 539 BC, it passed to the Greek in 332 BC. It became part of the Roman empire in 64 BC, and was later ruled by several different empires. Tyre is of interest for tourists due to the Al Mina and Al Bass archaeological areas (nowadays UNESCO world heritage sites), where there are ruins of the Roman period. The historic core of Tyre extends on a peninsula. On its northern side there is a harbour for fishermen. South of the harbour there is a small, but picturesque souk. Tyre can be easily visited as a daytrip from Beirut, for instance by car. The 82 km separating the cities can be covered in a bit over an hour, if there is no traffic jam. There are a few hotels bookable through the hotel portals in Tyre.